Lightweight & Easy to Operate! Opens and closes with the press of a button making it hassle free to get in and out of your car and into your home or workplace. 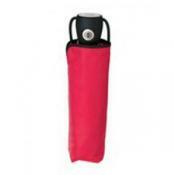 Folds to just under 9 inches in length for easy, convenient storage. Comes with matching storage sleeve. Full size canopy rain umbrella. Opens to 44 inch canopy arc dimension.